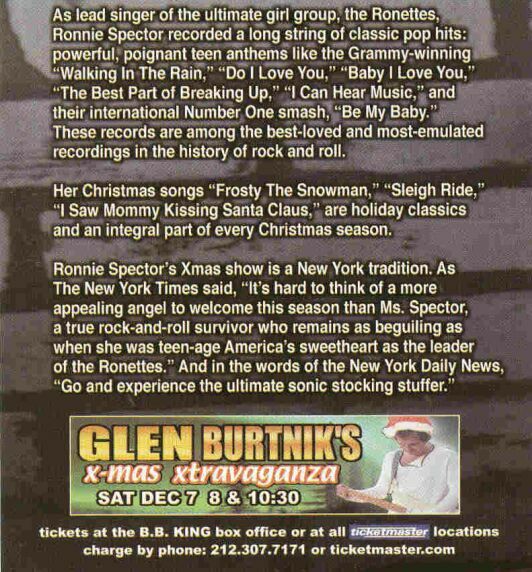 Saturday, January 26, 2002 -- S.V.A. 's FIRST MEETING of the NEWEST YEAR at the GAY, LESBIAN, BISEXUAL & TRANSGENDER COMMUNITY CENTER @ 4:15 p.m. to 6 p.m.
Saturday, February 23 -- SVA's MONTHLY MEETING at G*L*B*T CENTER @ 4:15 p.m.
Saturday, March 30 -- MONTHLY MEETING of the S.V.A. at THE G-CENTER @ 4:15 p.m.
Saturday, April 27 -- S.V.A. MONTHLY MEETING at the GAY COMMUNITY SERVICES CENTER @ 4:15 p.m.
Saturday, May 25 -- The S.V.A. MEETING at the G.L.B.T. CENTER @ 4:15 p.m. The S.V.A. annually leads with the blue 1969 Cadillac convertible "Stonewall Car" this mostly friendly Pryde Parade in the Borough of Queens. Line-up location is 37th Avenue and 90th Street in Jackson Heights. Parade steps off @ 12:30 p.m. Confirm your S.V.A. attendance with our Queens member, Tom Stevens, at (718) 357-7075. Remember QLGPC's long-standing, common sense, good advice: "Hey, if you wouldn't do it in front of your mother, you shouldn't do it at the parade!" Bi the way, Parade participants compete for the ever-popular "Queenie Awards". That title is very Stonewall. The term was coined by longtime Williamson Henderson friend and Queens Parade Co-Chair, Stanley M. Reed. QLGPC's general Co-Chairs are Danny P. Dromm and Maritza A. Martinez. 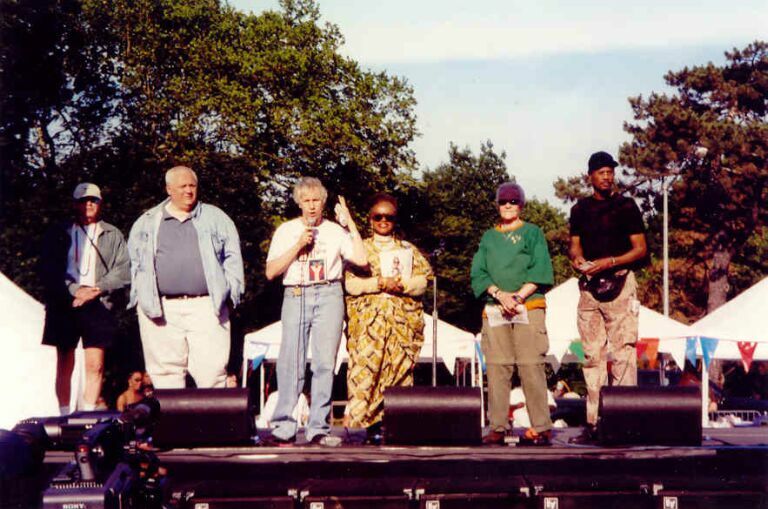 For further "411" about the Q's Gay Pryde Parade, the Pryde Rally at 75th Street, the Multi-Cultural Festival on 37th Road and the Queens Pryde Dance, call Queens Lesbian & Gay Pryde Committee ("QLGPC") at (718) 457-2928 or (718) 672-9366. Their e-mail address is: QLGPCMarch@aol.com. The Queens G.L.B.T. Pryde's website is: www.QueensPryde.com. You can also call the Queens Gay Pride Community Center at (718) GAY-2300. IQKNY's Princess Jenni June of Queens ridin' atop the beautiful "Stonewall Car"
Come see the 1969 "Stonewall Car" (with its lights on) at night. The parade kicks off @ 8 p.m. in Park Slope at 15th Street and Prospect Park West. This year's trifecta of Grand Marshals are appropriately the following: (A) STONEWALL Veterans' Association ("SVA"), (B) Gay Officers' Action League ("GOAL") and (C) Fire Flag ("FIRE"). The Multi-Cultural Festival is adjacent to Bartel-Pritchard Circle (15th Street and Prospect Park West) in Prospect Park from noon until 7 p.m. You can take the "F" train to Prospect Park Circle. Their Co-Chair Steven L. Gradman deserves honorable mention for his many, special, considerate accommodations of the S.V.A. at meetings, in the "Brooklyn Pride Guide" and arrangements to speak at The Rally. For all "411", call the Brooklyn Gay Pride Committee at: (718) 670-3337. Their website is: www.WorldConX.com/BrooklynPride. Stonewall veterans / S.V.A. officials shown on stage are (l-2-r): Ray McCaffrey (born in Greenpoint, Brooklyn), Jeremiah Newton (used to work in Brooklyn), Williamson Henderson (born in Flatbush, Brooklyn), Rev. Magora Kennedy (her church is in Brooklyn), Storme (in Brooklyn every year with the S.V.A. for Gay Pride) and Keith Lonesome (lives in Brooklyn). The STONEWALL Veterans' Association ("S.V.A.") was elected to be a "Grand Marshal" of the Brooklyn Pride Parade by virtually every "BP" member. As such, the Stonewall Vetz will be presented on stage, each introduced and they will speak, starting with "Give us an "S"..., give us a "T"..., give us an "O"...." besides leading the nighttime Brooklyn Gay Pride Parade. Other on-stage speakers include: U.S. Senator Charles E. Schumer, Brooklyn Borough President "SchMarty SchMarkowitz" (who, when he sees the S.V.A., ridiculously and insultingly yells out: "Lambda, Lambda, Lambda"), N.Y.C. Coucilmember and S.V.A. supporter Yvette D. Clarke, N.Y.S. Assembly candidate and S.V.A. backer Hakeem S. Jeffries and NYC Councilmember and S.V.A. Honorary Member James E. "Jed" Davis. Being Grand Marshal has special meaning to the S.V.A. as its Founder and Director, Williamson Henderson, was actually born in Brooklyn -- in Flatbush on Snyder Avenue, one block south of Church Avenue. Our first S.V.A. Secretary was Sonia Jane Attkiss from New Utrecht Avenue and 55th Street -- in Sunset Park, Brooklyn! They met in Manhattan at The Stonewall Club. After the "Stonewall Car" was impounded by the NYCPD on the first night of the Stonewall Rebellion, it was Sonia's parents -- Max and Helen -- along with Williamson and Sonia and Sonia's Stonewall girlfriend Lucy Santiago, who personally appeared the following night at the old 6th Police Precinct in Greenwich Village to get the car released. The car was then driven to Sonia's parents' house in Brooklyn. So, all these years later, the STONEWALL V.A. comes home, once again, car and all, to the N.Y.C. borough of our second home: Brooklyn, U.S.A.! Considering that the 1969 Stonewall Rebellion was triggered by a clash between Gay people and the New York City police -- after some of the latter invaded the former at the Stonewall Club -- it is the ultimate irony for two unique G.L.B.T. organizations, the STONEWALL Veterans' Association and the openly-Gay N.Y.C. police Gay Officers' Action League, to have a rendezvous. This comradery is not new. S.V.A. was founded in 1969 and G.O.A.L. in 1982. Members of S.V.A. speak at a G.O.A.L. meeting every year. Both S.V.A. and G.O.A.L. were the Grand Marshals the other evening (June 8) of the Brooklyn G.L.B.T. Pride Parade. This Gay Pride Month's speakers are as follows: Williamson Henderson, S.V.A. Director; Jeremiah Newton, S.V.A. Past President; Bert Coffman, S.V.A. Vice President; and Storme DeLarverie, S.V.A. Ambassador. Host is GOAL/N.Y. President P.O. Ann M. Cregan. The event takes place at the G.L.B.T. Community Center at 7:30 p.m. The 1969 "Stonewall Car" will be on display in front of The Center. Meeting begins @ 8 p.m. (previously 7 p.m.). For more "411" on the Gay Officers' Action League, call (212) NY1-GOAL or visit their website at: www.GOALNY.org. Held in scenic Huntington, Long Island. It parades along traditional Main Street. Formation area is off Main Street at West Neck Road and Clinton Avenue. Pre-Parade ceremony begins @ noon. The Parade starts @ 1 p.m. -- rain or shine! After the very Gay Parade is the "Pride in the Park Show". For more "411", call Long Island Gay Pride at (631) 321-0906 or (516) 562-5319. Their e-mail address is: info@LIPrideParade.com. Their website is: www.LIPride.com. Monday, June 17 -- MANHATTAN BOROUGH PRESIDENT C. VIRGINIA FIELDS' "A CELEBRATION OF G.L.B.T. PRIDE"
Yes, Virginia is a longtime friend of the STONEWALL Veterans' Association (S.V.A. ), both as a NYC Councilmember and now as Manhattan's Borough President for five years. Virginia is a wonderful, sincere, in-depth host. This year's event is being held in The G.L.B.T. Center's new Auditorium Room on the top floor. It will be adorned with huge rainbow Gay Pride flags by their original creator, Gilbert R. Baker, S.V.A. member. There will be a full program of honorees, socializing and gormet hors d'oeuvres. Introduction will be delivered by the G.L.B.T. Center's Executive Director, Richetta D. Burns. Event is from 6 p.m. to 8 p.m., including reception. Several Stonewall Veterans are confirmed to attend, including all of the S.V.A. elected officers namely Williamson, Jeremiah, Terri V.D., Emile G, Dave West, Storme D, Electra O and Rev. Magora. 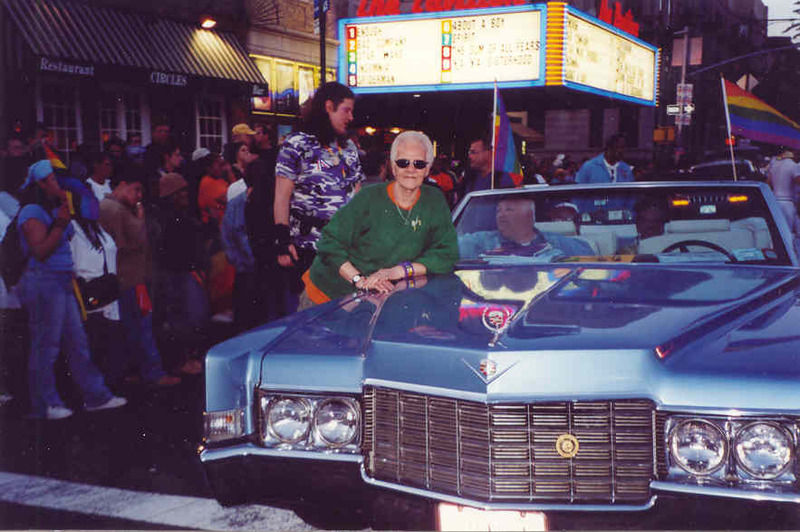 The STONEWALL Veterans' Association was the recipient of Miss Fields' "Gay Pride Award" in 1999, which was held at the regal Manhattan Surrogate's Courthouse building. The Manhattan Borough President, besides giving a memorable speech, even presented each Stonewall Veteran with an individual "Certificate of Merit". For additional "411" on this year's event, call the Manhattan Borough President's openly-Gay Director of Community Affairs and "Friend-of-SVA", Noah O. Pfefferblit, at (212) 669-8285. Thursday, June 20 -- N.Y.C. MAYOR MICHAEL R. BLOOMBERG'S "CELEBRATION in HONOR of GAY PRIDE MONTH"
New York City Mayor Michael R. Bloomberg hosts his first "Gay Pride Month Celebration" at gorgeous Gracie Mansion on the Upper East Side on East End Avenue and East 88 Street at the East River. He is continuing the Gay tradition commenced by Mayor Ed Koch (1978 to 1989). The S.V.A. 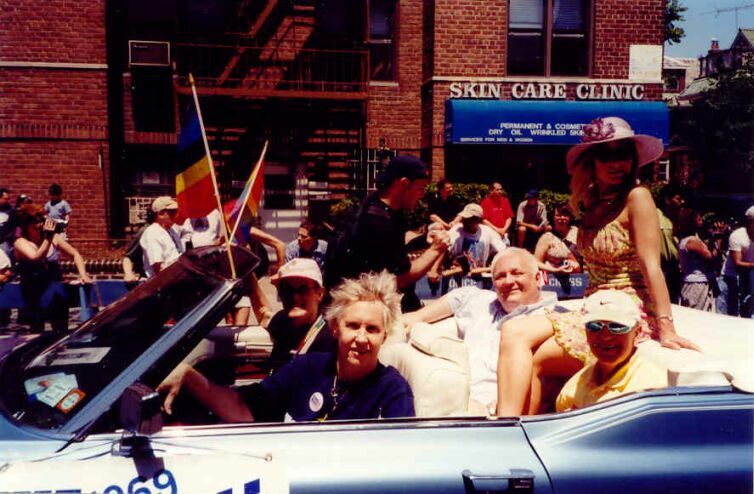 attended all eight annual "Gay Pride Celebrations" by Mayor Rudy Giuliani (1994 to 2001). In the recent mayoral election on November 6, 2001, the only G.L.B.T. groups which endorsed "Bloomy" for Mayor were: (1) PRIDE Democrats, which originated as the political strong arm of the STONEWALL Veterans' Association -- and just like Michael Bloomberg, PRIDE crossed "party lines" for the incredible 2001 election; by (2) Stonewall Republicans (no relation to the S.V.A., though Stonewall Veteran Tom Stevens is its president), the oldest Republican G.L.B.T. club in New York (1972); and by (3) the Log Cabin Club (formed in N.Y. in 1991). Of course, as is well-known, most individual members of the S.V.A. were very supportive and helpful of Michael-4-Mayor. Remember, the S.V.A. is not a political club! Last year, candidate Michael Bloomberg marched with the S.V.A. and as the guest of Mayor Rudy W. Giuliani, leading the annual New York City Gay Pride Parade with the 1969 "Stonewall Car". Many S.V.A. members were at Mayor Bloomberg's winning election night victory parties, including at B.B. King's Nightclub in Times Square -- and even more were at his grand Inauguration at City Hall on January 1, 2002. The 1969 "Stonewall Car", by the way, will be on display at this mayoral G.L.B.T. event as it has been in the past. The celebration party is from 5 p.m. to 7 p.m. Note: The Mayor's event is by pre-arranged, mailed invitation only. Monday, June 24 -- NYC GAY COMMUNITY CENTER'S "19th Annual GARDEN PARTY"
"The Center" is the nickname for the Gay, Lesbian, Bisexual and Transgender Community Services Center at 212 West 13th Street (between Seventh and Greenwich Avenues) in North Greenwich Village, New York. The Center's "Garden Party" (minus any gardens) is always held the Monday of "Gay Pride Week" -- and outdoors (of course), usually in front of The Center. This year, however, it will again be held three blocks west of The Center at Seravalli Playground at Hudson Street and Gansevoort Street, one block west of Eighth Avenue. It is their premier fund-raising event replete with worthwhile GLBT groups and businesses' information tables, food and beverages, entertainment, speeches, exhibits, awards, guest celebrities, auctions, networking and later on, dancing. Expect to see many N.Y.C. and N.Y.S. public officials. The S.V.A. is always there with our display table and lavender flyers. On display: the 1969 Cadillac "Stonewall Car". Event starts at 6 p.m.; ends at 10 p.m. For more "411", call The Center at (212) 620-7310 or visit: www.GayCenter.org. Tuesday, June 25 -- NEW YORK CITY COUNCIL'S "A CELEBRATION OF PROGRESS, INCLUSION, UNITY & G.L.B.T. PRIDE"
"New" City Council Speaker A. Gifford Miller will host this long-standing event, which had been overseen for years by former Council Speaker Peter F. Vallone, an S.V.A. supporter. The former will be presenting STONEWALL Veterans' Association with a special "Proclamation". We especially appreciate this award as many Stonewall Veterans testified before the City Council as far back as 30 years ago on behalf of Gay rights (that's what it was simply called then) -- and long, long before there were any "openly-Gay" City Council members. In a letter of praise sent to the S.V.A. by Speaker Miller, he stated: "As always, I deeply appreciate and admire the fine work performed by the STONEWALL Veterans' Association (S.V.A.) on behalf of our city's GLBT communities. The preservation of history is one of the greatest gifts we can bestow upon the world, and for over three decades now, S.V.A. has helped keep the spirit of the Stonewall legacy alive for countless individuals and their loved ones." Unfortunately, he chose not to donate a dollar to help the S.V.A. "preserve" (such as the "SW-Car" garage bill) all that fab history. This GLBT Pride event on Tuesday, June 25 (the birthday of a Stonewall vet) takes place at City Hall Council Chambers from 6:30 p.m. to 8:30 p.m. Use the Centre Street/Park Row entrance to City Hall. The r.s.v.p. telephone number is: (212) 788-9178. Thursday, June 27 -- "NEW YORK DAILY NEWS STORY: A SYMBOL OF GAY PRIDE KEEPS ROLLING ALONG"
On the actual 33rd anniversary of the Stonewall Rebellion, the New York Daily News ran a special feature article on the famous 1969 "Stonewall Car". Many people were interviewed to recapture the 33-year history of perhaps the most famous car in America. Among those were former N.Y.C. Mayor Koch, the NYPD 6th Precinct, Congressmember Carolyn Maloney, S.V.A. 's legal adviser Hal Weiner, the car's mechanic Ami Dayan and many Stonewall Veterans including Williamson, Storme, Jeremiah, Terri, Ray, Leigh, Bert, among others. Investigative journalist Tara Crosson actually wrote a much larger story than was printed, however, the article was on the front page of the popular "New York Metro" section. The story was about the car not the S.V.A. The only error was that Williamson was the original owner of the car and not the current owner as their editor misstated. The car is now owned by the STONEWALL Veterans' Association (thanks to the grand and selfless generosity of Williamson). To read this story (6/27/02), visit the Daily News' website at: www.NYDailyNews.com. Cher & Stonewall are the perfect combo for June 27th! Expect Cher to sing several Stonewall songs such as "I Got You Babe", "Bang Bang", "The Beat Goes On" and "You Better Sit Down Kids". Included from the S.V.A. are Williamson Henderson, Terri Van Dyke, Electra O'Mara and Dave West. The can't-wait-for-this-one concert is at marvelopus Madison Square Garden. Concert entrance is at Seventh Avenue and West 32nd Street. Divatime is @ 8 p.m.
On Saturday, June 29 @ 4 p.m. (a tad earlier) until 7 p.m., the S.V.A. holds its special function at the G.L.B.T. Center at 212 West 13th Street, Manhattan, NY. Topics include, but are not limited to: N.Y.C. Gay Pride Parade final plans and preparations, S.V.A. anniversary events, awards presented to the S.V.A., Gay Pride speaking engagements, the STONEWALL Newzletta, the "Stonewall Car", dealing with the "Gay Taliban", etc. Reports on contacts with various public officials and correspondence that the S.V.A. received. That leaves out the "Gay Taliban"! New York representatives from three different public officials are confirmed. No, not the "Gay Taliban". Light foods and cool beverages are provided. Special music of the "Songs of The Stonewall". The S.V.A. 's June meeting also functions as a reunion of Stonewall Veterans. Some members only attend this special meeting! Plus, out-of-state veterans confirmed to attend -- having traveled to New York for Gay Pride Weekend -- include LaLa Belle Meyers ("The Southernmost Queen") from Key West, Florida; Mark Zatlow from Los Angeles, California; and Cristina Hayworth from San Juan, Puerto Rico. Afterwards, we all go out to an outdoor dinner at the Hudson Corner Cafe, where we park the blue 1969 Cadillac convertible "Stonewall Car" out front for all to view. For more "411", call S.V.A. Vice-President Berti Coffman at (212) 889-4262. Traditionally, the "New York City G.L.B.T. Pride Parade" is lead by the STONEWALL Veterans' Association of the 1969 Stonewall Rebellion and S.V.A. 's flotilla of vintage 1960s convertible cars, including the 1969 blue Cadillac "Stonewall Car". The event with marching bands, dancing groups, balloon arches, disco music, decorated floats, drag queens, skating clowns, dressed-up dogs, etc., is a 'Parade' not a 'march'. Only the historic first anniversary in 1970 and the special 25th anniversary in 1994 were 'marches'. By the way, the motorcycles do not 'lead' the Parade, they are the 'escorts'. In other words, they signal the start of the Parade and clear the street -- like the motorcycle escorts in a presidential motorcade. The Parade is always occasioned on the last Sunday (not the fourth Sunday) in June to commemorate the last weekend of June in 1969 when the Stonewall Rebellion began. S.V.A. will have two very special guests: one will be S.V.A. Honorary Member/N.Y.C. Mayor Michael R. Bloomberg (who marched with the S.V.A. and Mayor Rudy W. Giuliani last year) and the other will be the lovely U.S. Congressmember Carolyn B. Maloney, who is also S.V.A. 's Honorary Female Chairperson. The Parade always kicks-off on time @ 12 noon at Fifth Avenue and 52nd Street. Those Stonewall Veteran members joining the S.V.A. contingency must r.s.v.p. with S.V.A. 's Jeremiah Newton. Stonewall Veterans confirmed to attend include: Williamson Henderson (Dir. ), Jeremiah Newton (President), Bert Coffman (Vice-President), Terri Van Dyke (Treasurer), Ray McCaffrey (Financial Sec'y), Rose Jordan (Acting Sec'y), Dave West (Public Relationist), Storme DeLarverie (Ambassador), Rev. Magora Kennedy (Chaplain), Keith Lonesome (former V.P. ), Cristina Hayworth (up from PR), Mark Zatlow (in from CA), LaLa Belle Meyers (up from FL), Archbishop Charles Snyder, Yvonne Ritter, David Foxworth, Meredith Nelson, Gilbert Baker, Shelli Vannelli, Greg Terry, "Papa" Jean DeVente (down from CT and in her own Mustang), Amir Qaharr and, of course, others along the parade route, including Fred the F "Tree" Folk. After the Parade, the S.V.A. has its annual, outdoor "Stonewall Brunch" at the Hudson Corner Cafe (with the white picket fence) on Hudson Street (at West 11 Street). Look for the "Stonewall Car". Reservations have been made with Sister Agnes. Their phone number is: (212) 229-2727. For more "411" regarding the Parade, you can call Heritage of Pride ("H.O.P. "), the volunteer parade organizers, at telephone (212) 80-PRIDE. H.O.P. 's website is as follows: www.nycPride.org. Update: Due to the September 11th tribute, the N.Y.C. Mayor will march with GOAL (Gay police officers) and Fire-Flag (Gay firepeople). The Mayor will literally be "succeeded" in the parade by Public Advocate Betsy F. Gotbaum -- as a guest of the S.V.A..
S.V.A. instantly supported this worthwhile and patriotic project which will benefit the families of police and emergency relief personnel who were murdered or made disabled in the two (2) World Trade Center attacks in Lower Manhattan on the tragic morning of Tuesday, September 11, 2001 (a.k.a. "9/11"). This patriotic, impressive, historic stamp depicts three New York City firefighters dramatically raising the American flag at "Ground Zero" amid the destruction after the terrorist attacks. The three New York City firefighters pictured on the stamp are (l-to-r): George Johnson, Dan McWilliams and Billy Eisengrein. The stamp is a "postage plus" wherein it sells for 45¢ on a sheet of 20 stamps. The additional 8¢ over the 37¢ postage is being donated by the United States Postal Service (USPS) to the Federal Emergency Management Agency (FEMA) for the "9/11" beneficiaries. 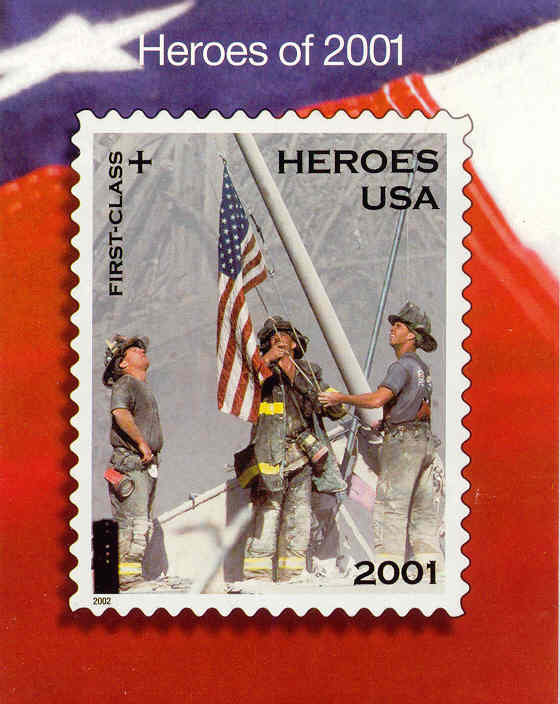 The 9/11 Heroes Stamp Act of 2001 directs the USPS to transfer the net proceeds to FEMA. The only other known G.L.B.T. organizations participating are: the Gay Officers' Action League (GOAL), the Gay Firefighters (FireFlag) and PRIDE Democrats. Besides your local post office, the "Heroes" stamps are available at: www.USPS.com or by calling (800) STAMP-24. Saturday, July 27 -- STONEWALL VETERANS' ASSOCIATION "JULY MEETING"
Our mid-summer, post-Gay Pride Month, post-parades, monthly membership meeting will be held at the G.L.B.T. Center. We will review all of the 2002 G.L.B.T. Pride events that S.V.A. participated in, were honored at or organized. All members are urged to bring their photos of the different events showing our Stonewall Veterans. You can also thoughtfully bring copies of pix to distribute. S.V.A. maintains an archive of photos -- "past, present and future". We always look forward to our outdoor, celebratory dinner after the meeting. The monthly meeting on Saturday, July 27 begins @ 4:15 p.m. Complementary, gourmet appetizers and drinx will be provided. For direx, call The G.L.B.T. Center at (212) 620-7310. Dinner is scheduled for 6:30 p.m. at a S.V.A.-supportive, outdoor, outfront, Greenwich Village restaurant: Florent Restaurant, 69 Gansevoort Street (between Greenwich St. and Washington St.) in the Meat-Packing District of the West Village, NY. Their phone number is: (212) 989-5779. S.V.A. 's number is: (212) 6-27-1969. Note: S.V.A. 's symbolic phone number is the exact date of the first night of the Stonewall Rebellion... June (the sixth month) 27, 1969. Black Gay Pride (August 1 to 4 -- why August?) has various events including an "Awards Cocktail Party" (honoring Manhattan Borough President C. Virginia Fields with the Sojourner Truth Award), viewing two plays, a "Gay Harlem Tour", seminars, "Family Day in the Park" (Fort Greene, Brooklyn on Saturday), an "Inter-Faith Service" (at the G.L.B.T. Center on Sunday at 10 a.m.), a beach party (Riis Park, Brooklyn) and this special march -- all with the theme: "Generations: Then, Now and Tomorrow". An official, J. L. Pressley, of Black Gay Pride attended the S.V.A. 's July 27th meeting to invite and plan S.V.A. 's involvement. The STONEWALL Veterans' Association's people of color 1969 Stonewall Rebellion veterans will lead the march from Stonewall Place -- in front of the Stonewall Club -- with the historic 1969 convertible "Stonewall Car". The march is a tribute to remember the G.L.B.T. people of color who have died over the past two-plus decades from AIDS. Speakers, including S.V.A. 's former Vice-President Keith Lonesome and S.V.A. Chaplain Rev. Magora, will speak before the march starts at 7:30 p.m. The march travels along Christopher Street to the Hudson River. For more "411", call (212) 613-0097. Their website is: www.BlackPrideNYC.com. Saturday, August 24 -- S.V.A. 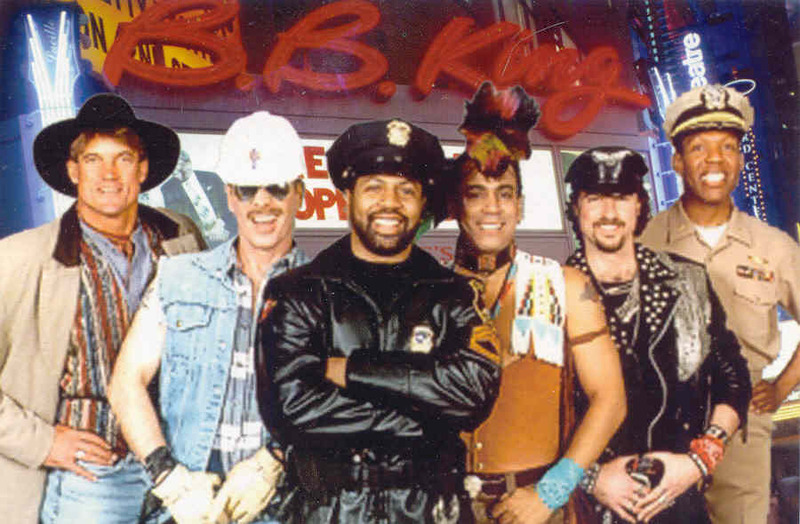 GOES to THE VILLAGE PEOPLE's CONCERT @ B.B. 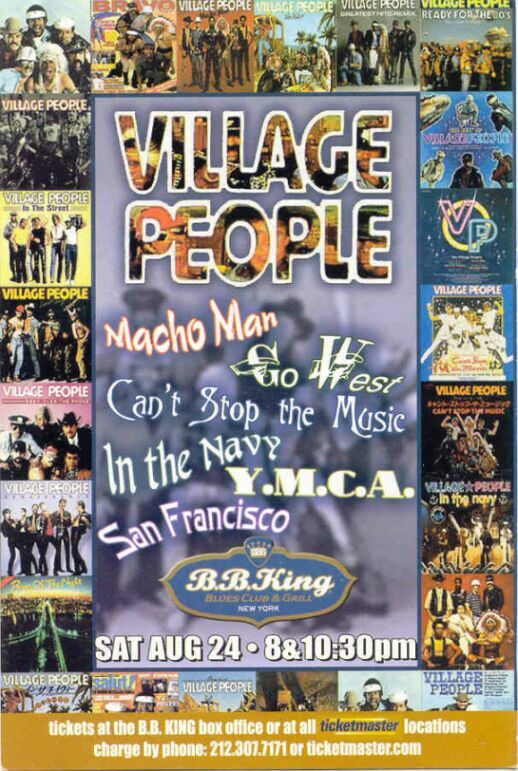 KING's NIGHTCLUB in MANHATTAN @ 10:00 p.m.
SVA-ers confirmed to see the legendary, exciting and inimitable singin' 'n' dancin' Village People include, but will not be limited to, the following: Williamson Henderson, Terri Van Dyke, Electra O'Mara, Dave West (who actually performs "In The Navy", one of the Village People's hit songs), Leigh McManus and Rev. Magora Kennedy. Pending attendees are Jeremiah, Rusty, Berti, Ray, Dianne, Keith and/or Jon. Also posilutely attending is the singin' 'n' dancin' S.V.A. Assistant Andre "Macho Boi" Christie. We are going to the second VP show, meeting out front of BB's @ 10 p.m. and the showtime is 10:30 p.m. (ahem). The nightclub location in the Times Square area is on West 42 Street between Broadway and Eighth Avenue. Additional B.B. King's event 411 is on the promo card below. in Greenwich Village, New York City. "VP" is thus analagous to "Gay People"! Saturday, August 31 -- S.V.A. MONTHLY MEETING at THE CENTER @ 4:15 p.m.
S.V.A. will plan its autumn schedule, update communications wth public officials and G.L.B.T. organizations, planned meetings with public officials, discuss very needed fund-raising, nominate "86" candidates to the "Stone-Wall-of-Shame", and much more. Dinner @ 7 p.m. after the meeting at the aptly titled Stonewall Bistro on Seventh Avenue South at Christopher Street/Stonewall Place. Wednesday, September 4, 2002 -- N.Y.C. PUBLIC ADVOCATE BETSY F. GOTBAUM'S SPECIAL MEETING with S.V.A. OFFICIALS @ 4 p.m. Representing the S.V.A. wil be President Williamson Henderson, 2nd Vice-President Bert Coffman, Chaplain Rev. Magora Kennedy and Assistant Andre M. Christie. The meeting takes place at the offices of the Public Advocate Betsy Gotbaum in the historic Municipal Building. Wednesday, September 11th, 2002 -- S.V.A. IS CLOSED in TRIBUTE to the FIRST TRAGIC ANNIVERSARY of the WORLD TRADE CENTER CATASTROPHIC TWO TERRORIST ATTACKS!! and the TWO OTHER FOREIGN TERRORIST ATTACKS in VIRGINIA and PENNSYLVANIA!! The STONEWALL Veterans' Association ("S.V.A.") will be totally closed and will not accept or make any telephone calls, faxes, e-mails, etc. in honor of all of the victims -- both deceased and living -- of the brutal, cowardly, depraved, violent, extremist Islamic hijackers / thieves / murderers who invaded America by sneak attacks last year on September 11th with four separate attacks (two in Manhattan, NY; one at The Pentagon in Arlington, VA; and one plane crash in Shanksville, PA). We are aware and remember, too, the courageous "first responders" who are ill as a result of their brave helping at the devastated scene of the crimes at the WTC. Over 3,000 people, including seniors, teenagers, children and infants in addition to pets were killed. We urge everyone, unless you are forced to work or are involved in one of the tributes, to stay at home to remember, respect and reflect. There will be unprecedented all-media coverage for this unprecedented event. There will be special tribute appearances at the World Trade Center site by U.S. President George W. Bush and First Lady Laura W. Bush, U.S. Secretary of State Colin L. Powell, N.Y.S. Governor George E. Pataki, N.Y.C. Mayors Edward I. Koch (1978-1989), David N. Dinkins (1990-1993), Rudy W. Giuliani (1994-2001) and Michael R. Bloomberg (2002), U.S. Senators Charles E. Schumer, Hillary R. Clinton and Jon S. Corzine; and many U.S. Congressmembers, including S.V.A. 's Honorary Chairperson, Carolyn B. Maloney, and S.V.A. supporters Charles B. Rangel, Nita M. Lowey and Joseph J. Crowley. For pertinent background "411" go to the website at: www.FoxNews.com. Then visit featured site #15 - World Trade Center graphic and site #26 - World Trade Center facts. Suggested "Song of The Stonewall": "Reflections (Of The Way Life Used To Be)" (1967), an appropriate, pensive, number one song by Diana Ross & The Supremes. 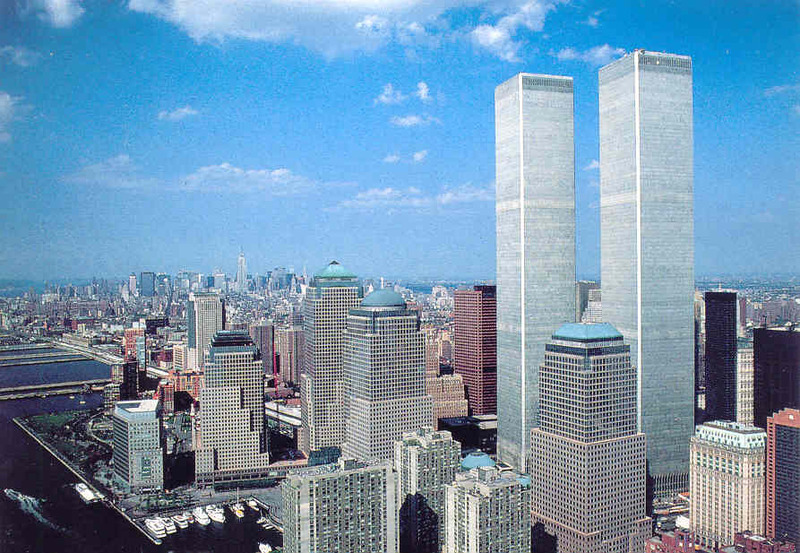 Ironically, 1967 was the year construction began on the World Trade Center's Twin Towers. In 1969, at the time of the Stonewall Rebellion, the shiny sister skyscrapers were soaring toward the sky. Commercial tenants first moved into the North Tower in December 1970. In the 1980s, "Reflections" was the opening theme song of the popular television show "China Beach". After 30 years, in July 2000, Diana Ross & The Supremes had their long-awaited, national "reunion" concert tour. The opening song was "Reflections". For photos of the event and other "411", visit their website: www.DianaRossandTheSupremes.com. In any event, remember all of the victims of September 11th through "Reflections" whether in song and/or in mind and heart. Wednesday, September 18 -- MANHATTAN BOROUGH PRESIDENT C. VIRGINIA FIELDS' SPECIAL MEETING with S.V.A. OFFICIALS @ 4 p.m. This is a private meeting between our Honory Member -- the M.B.P. Virginia Fields -- and two heads of the S.V.A. : Williamson Henderson, President (an openly longtime favorite of Miss Fields) and Reverend Magora Kennedy, Chaplain (clearly also representing women and people of color). The meeting happens at the offices of the Manhattan Borough President. Saturday, September 28 -- S.V.A. MONTHLY MEETING at THE CENTER @ 4:15 p.m.
Review of the S.V.A. 's summer events and happenings, including separate meetings with U.S. Congressmember Carolyn B. Maloney, N.Y.C. Public Advocate Betsy F. Gotbaum, Manhattan Borough President C. Virginia Fields, N.Y.S. Assembly candidate from Brooklyn (57th District) Hakeem S. Jeffries, et al. Also, S.V.A. 's quarterly Director's report from Williamson Henderson. Meeting will be presided over by S.V.A. President Jeremiah Newton. S.V.A. Secretary Electra O'Mara will reveal the "Stone-Wall-of-Shame" shameful inductees, such as "Herman". This month's special guest speaker is openly-Gay, New York City police officer Kevin M. O'Donnell (no relation to big mouth Rosie who's never done nuttin' for the S.V.A. though mailed 411 and asked many times). Kevin is nice, tall, athletic, generous, good looking, a great speaker and, most importantly, an appreciator and supporter of the S.V.A. Officer Kevin is from the police precinct "where it all started": the Sixth! He will discuss local G.L.B.T. community concerns, the effects of the enemy attacks on Manhattan on September 11, 2001, and S.V.A. input regarding the annual G.L.B.T. Pride Parade -- overseen in Greenwich Village, on Christopher Street, at the Stonewall site and the Washington Street dispersal area by the NYCPD Sixth Precinct. After the meeting, "out" to dinner at the appropriately-named Stonewall Bistro Restaurant at 113 Seventh Avenue South off Christopher Street at Stonewall Place. We will have the beautiful 1969 Cadillac "Stonewall Car" on display. Wednesday, October 2 -- N.Y.C. COMPTROLLER WILLIAM C. THOMPSON'S SPECIAL MEETING with S.V.A. OFFICIALS @ 4 p.m. Confirmed to attend from the S.V.A. are Williamson Henderson and Bert Coffman. Representing the Comptroller are Jeff Simmons and Walter. The meeting is in a N.Y.C. Comptroller conference room in the Municipal Building at 1 Centre Street near City Hall. Friday, October 11 -- N.Y.C. COUNCILMEMBER CHRISTINE QUINN'S FIRST MEETING with S.V.A. OFFICIALS @ 3 p.m. Although S.V.A. non-supporter Christine Quinn is openly-Gay herself and she has been a New York City Councilmember representing our homebase and the Gayest district for nearly four years (January 1999), this is queerly the first meeting between the S.V.A. and C.Q. It was suggested and arranged by S.V.A. 's Treasurer Terri Van Dyke, who was unable to attend (though he was raring to go) due to a serious health condition with unpredicatble side effects. The S.V.A. has a 'top 10' agenda of bullet-point items. Representing the STONEWALL Veterans' Association is President Williamson Henderson, Vice-President Bert Coffman and Executive Committee member Bob Barkan. The location is Councilmember Christine's district office at 265 West 40 Street in Suite 803 at Eighth Avenue on the outskirts of Midtown Manhattan. Meeting Footnail: Basically, due wholly to Miss Quinn, what could have been a "fresh start" meeting turned out to be a total waste of time and energy for the three non-paid S.V.A. officials. Although the one-hour meeting was informal and cordial, at its conclusion, after many basic, simple suggestions were presented to Christine such as her attending an S.V.A. meeting, support of the Stonewall veterans, being a sponsor of the S.V.A., sending a letter of praise, etc. Christine surprisingly stated that she'd "...think about it". She never sent a note nor gave a dollar. After all these years, she's still thinking about it? Sounds really slow, disingenuous or evasive -- and likely all three. Really, what's to "think" about at this stage? The S.V.A. never heard another word from "Qwistine Qwinn" ever again and, needless to say, but we will anyway, nor a letter nor a dollar! When the S.V.A. states that "Q-Trip" is "shameful", we mean it! She really is! We know! Shame on her - again and again! Saturday, October 12 -- THE BRONX'S "BOOGIE DOWN GAY PRIDE FESTIVAL & RALLY"
This celebration on "National Coming Out Day" in The Bronx is dubbed "Come Out, Come Out... Wherever You Are... with Boogie Down Gay Pride". The festival is being held at the J. Yancey Track and Field located at East 161 Street and River Avenue across from Yankee Stadium. There will be mucho G.L.B.T. entertainment. The time is from noon until 7 p.m. For more "411", call Eric Soto at (718) 293-8885 or e-mail to: BoogieDownPride@aol.com. Saturday, October 26 -- S.V.A. MONTHLY MEETING at THE CENTER @ 4:15 p.m.
Reports by S.V.A. 's Vice-President Bert Coffman on recent meetings with public officials and G.L.B.T. organizations. Schedules for up-coming speaking engagements. Attendees will include representative Jeff Simmons from the N.Y.C. Comptroller Bill C. Thompson's office to present his letter of praise to the S.V.A., a staffer from N.Y.S. Senator Liz S. Krueger with her S.V.A. sponsorship check and Brooklyn Gaay Pride's Co-Chair Steven Gradman with special thanks for the S.V.A. being a parade "Grand Marshal". Updates on the "Stone-Wall-of-Shame". Planning for the 29th annual "Greenwich Village Halloween Parade" on Thursday, October 31 @ 7 p.m.
Congressmember Bella S. Abzug adroitly served three terms in the U.S. Congress representing a Manhattan Congressional District from 1971 to 1976. She was the one and only "Mother of the Gay Community". In 1975, "Battling Bella!" bravely introduced in Congress a Civil Rights Law to include Gays! Bella! was also the Honorary Female Chairperson of the STONEWALL Veterans' Association for over a quarter-of-a-century until she died in a New York City hospital on the East Side in Manhattan on Tuesday, March 31, 1998 at nearly 78 years of life. This is the first committee meeting to memorialize Bella! The S.V.A. is expectedly and appropriately the first G.L.B.T. organization to sign on to the "B.S.A." project. The meeting is at the Women's Environment & Development Organization ("WEDO") headquarters on the third floor at 355 Lexington Avenue at East 40 Street in Manhattan at 5 p.m. You can visit WEDO with their biographical 411 about Bella! at: www.WEDO.org. For further "411", call Liz J. Abzug at: (212) 346-9699 or e-mail Liz at: LJAnys@aol.com. Saturday, November 30 -- S.V.A. MONTHLY MEETING at THE CENTER @ 4 p.m. Nominations for S.V.A. 's 2003 Officers. The S.V.A. website had its busiest month ever -- this month! Updates on S.V.A. supporters and meetings with public officials and G.L.B.T. groups. Selection of December's shameful "Stone-Wall-of-Shamer". Planning for next Spring's "Stonewall Showtyme" at the legendary Stonewall Club. S.V.A. Boardmember/Stonewall Vet/District Leader/Community Board #2 President Aubrey L. Lees will be joining us. After this meeting is "S.V.A. 's Thanksgiving Dinner" at the Stonewall Bistro @ 7 p.m. Let S.V.A. 's Andre know if you plan to attend at: (212) 6-27-1969. For more 411 about the bistro or direx, their telephone # is (917) 661-1335. This is the second B.S.A. committee meeting. "Same time, same place". See details above on October 29th entry. very light snow. The next B.S.A. Statue meeting will be on Thursday, January 16, 2003. See "S.V.A. Photo Album & Narratives" website link for more on Bella! Sunday, December 8 -- McMANUS DEMOCRATIC ASSOCIATION's "ANNUAL HOLIDAY PARTY" at McMANUS CLUBHOUSE from 6 to 9 p.m. Confirmed to attend from the S.V.A. are: Williamson Henderson, Ray McCaffrey, Terri Van Dyke, Leigh McManus and Rev. Magora Kennedy. Wednesday, December 11 -- CONGRESSMEMBER CAROLYN'S "CHRISTMAS CAROLING CELEBRATION" & OPEN HOUSE POLITICAL FORUM at MT. SINAI HOSPITAL SEMINAR AUDITORIUM from 6 to 8 p.m. Confirmed to attend our Honorary Female Chairperson "Carolyn's Christmas Celebration" from the S.V.A. are officers Williamson Henderson and Terri Van Dyke in a wheelchair pushed by Andre Christie. Also attending the happy holiday festivities is Terri's father Sir Robert Van Dyke and Lady Lillian Siracuse. Thursday, December 12 -- "BROOKLYN HOLIDAY GAY PRIDE CELEBRATION & AWARDS"
This significant off-season G.L.B.T. event was conceived by and is hosted by lively and handsome N.Y.C. Councilmember James E. "Jed" Davis. The STONEWALL Veterans' Association is an award recipient for its on-going G.L.B.T. leadership, innovations and successes for over three decades. After the Borough of Manhattan, the S.V.A. is next most involved in the Borough of Brooklyn. The founder of S.V.A., Williamson L. Henderson, was born in Brooklyn in famous Flatbush! The S.V.A. was a Grand Marshal of the Brooklyn Gay Pride Parade this year. Councilmember Jed Davis will personally speak, lauding the S.V.A. and will personally introduce his intimate friend S.V.A. Director Williamson. As Jed calls him, "Mr. Stonewall" will proudly accept the award and speak on behalf of the S.V.A. The S.V.A. 's Vice-President Bert Coffman (former Brooklynite) and 2nd Vice-President Keith Lonesome (from Brooklyn) will also be present for the honors. Confirmed honorees include the Gay Officers' Action League ("GOAL"), Brooklyn Gay Pride Parade Committee, Brooklyn Unity Fellowship Church and Black Pride/NYC. Confirmed guest N.Y.C. Councilmembers include David I. Weprin as well as a future Councilmember, Jed's younger brother Geoffrey A. Davis. The prideful event takes place at Long Island University on DeKalb Avenue off Flatbush Avenue from 6:30 p.m. to 9:00 p.m. Enter the Library Learning Center (LLC) at Little Hudson Street. There will be professional entertainment, mucho suppertime foods and varied beverages. Convenient subways are the "N", "Q", and "R" (DeKalb Av. Station) as well as the "2", "3", "4", and "5" (Nevins St. Station). For further "411", call Jed's Councilmatic office at: (718) 857-0959. Saturday, December 21 -- S.V.A. 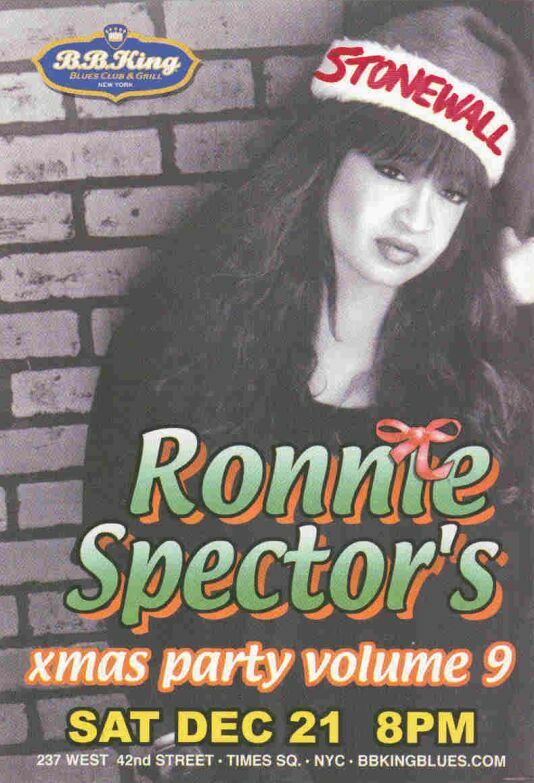 GOES to RONNIE SPECTOR'S X-MAS PARTY at B.B. KING'S NITECLUB @ 8 p.m.
Saturday, December 28 -- S.V.A. MONTHLY MEETING at THE G.L.B.T. CENTER @ 4:15 p.m.
Election of the S.V.A. 's 2003 Officers (except President, still elected at the half-year). Additional "411" added to the S.V.A. website throughout all sections, especially bios. Voting on next month's "Stone-Wall-of-Shamer". There are a dirty dozen of nominees -- which can be a person, a non-personna, a public official, a group or a business! Annual financial report by S.V.A. Financial Secretary Ray McCaffrey. The "S.V.A. Holiday Dinner" is after the meeting. For further meeting or dinner info, call Andre at (212) 6-27-1969. S.V.A. Website Busiest Month: November 2003 -- over 67,000 successful website "visits"
S.V.A. Website Busiest Week: December 1 to December 7, 2003 -- over 17,400 successful "visits" in one week! S.V.A. Website Busiest Day: Monday, March 31, 2003 -- over 4,000 successful "visits"
Website 2nd Busiest Day: Friday, March 28, 2003 -- over 3,550 successful "visits"
Website 3rd Busiest Day: Saturday, November 1, 2003 -- over 3,500 successful "visits"
Website 4th Busiest Day: Friday, August 1, 2003 -- nearly 3,400 successful "visits"
Website 5th Busiest Day: Saturday, July 12, 2003 -- nearly 3,300 successful "visits"
Website 6th Busiest Day: Wednesday, October 1, 2003 -- over 3,250 successful "visits"
Website 7th Busiest Day: Tuesday, October 21, 2003 -- over 3,225 successful "visits"
Legal Counsel: Hally M. Weiner, Esq. Additional 411 added -- believe it or not... more to come!